The V.01 collection of interactive watches sporting a manually rotatable bezel that allows them to change appearance, is graced by the V.01 Titanium Red Gold model. 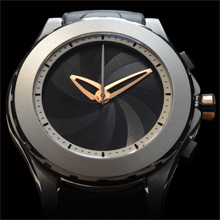 Valbray V.01 Titanium Red Gold was presented for the first time in Baselworld international fair in 2011. Entirely made by Titanium with enchanting details made of 18-carat red gold, it is a feast for the eyes. Feather-light because of the titanium and satin-smooth due to its finish, the V.01 Titanium Red Gold is a pure-blooded sportive watch with a classic side. The latter is accentuated through the use of red gold for the little details: the V of Valbray on the dial, the hands of the watch and the crown take a magical appearance when light reflects on them. The honeycomb grid of the dial gives the watch a contemporary and aggressive feeling and along with the playful hour indication –at 3.5- make it irresistible. Once more, the Valbray patent of the rotating bezel mechanism, which allows a double display, makes the hands itch to play with it. 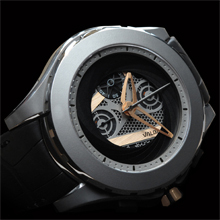 Once the obturator is closed, it turns into a 3-hand watch, sober, minimalistic and modern. When the obturator is open, the watch becomes a sportive chronograph which also shows the date. The resistance of the watch has been further increased and now reaches 5 ATM. The technical look is reinforced by the hour and minutes path engraved on the bezel and from the black sapphire crystal on the back, from which the well finished movement of the watch can be admired. 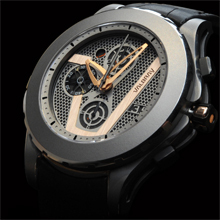 It comes with a handmade black alligator strap with a deployante buckle for a luxurious and tasteful finishing touch. The Valbray V.01 Titanium Red Gold is available in 250 numbered pieces, making it an exclusive piece of portable art, and can now be found in France at Colette in Paris, at Temps et Passions in Monaco and at Daniel Gerard Joaillier in Thionville.